What I would like to highlight, however, is the Feast of the Hieromartyr Cyprian and Virgin-Martyr Justina, which the Holy Church celebrates at the beginning of October every year. It is a feast that speaks to us about our relationship with evil, sorcery, witchcraft, and similar things. We celebrate the feast of these remarkable saints who gave their lives to Christ despite once being devotees of witchcraft, sorcery, and black magic. Cyprian, for example, was for many years a great sorcerer and master of black magic who used his skill to persecute many Christians. In his Oration 24, the Holy Gregory the Theologian notes that Cyprian was “a healer by means of demons and a most bitter persecutor of Christ.” Indeed, he is described as having traveled throughout the known world in search of more powerful spells and the knowledge of dark arts, and certainly, the demons rewarded his efforts and gave him many victories over Christians who were negligent in their faith. Justina was similarly a child of paganism in her early life. Her father, Aidesios, was a pagan priest who raised her as a worshipper of idols for many years. She grew up knowing nothing but idolatry. So what happened to them? How did these pagans who practiced sorcery, witchcraft, and black magic ultimately become holy martyrs who are remembered by the Church every year? Justina had always questioned her parents’ pagan beliefs, so she entreated God to help her find the Truth, not unlike Abba Moses and many other saints who came from the darkness into the light. God heard her prayers and allowed her to listen to a homily delivered by one of the deacons of Antioch in which he spoke about God’s love and the redemptive work of our Lord Jesus Christ. Her heart was enflamed with his words, so she began attending church in order to learn more. Finally, she spoke with her parents, who didn’t believe at first, but after Christ appeared to her father in a dream, the whole family rushed to receive Holy Baptism. Her father, Aidesios, ultimately was ordained as a Christian presbyter. As a result of her great beauty, she caught the eye of a certain young man, Aglaïdas, who routinely made overtures to her. Finally, when he could not contain his lust, he kidnapped her, but she was rescued immediately by her family. Defeated and ashamed, he sought the counsel of the great sorcerer and magician, Cyprian. Aglaïdas begged him to change her mind through magic. Cyprian and the demons with him were arrogant and believed this was an easy task, since they had done this before. Cyprian cast his first spell upon Justina, something to make her fall in love with Aglaïdas, and indeed, she began to feel the pangs of love in her heart. 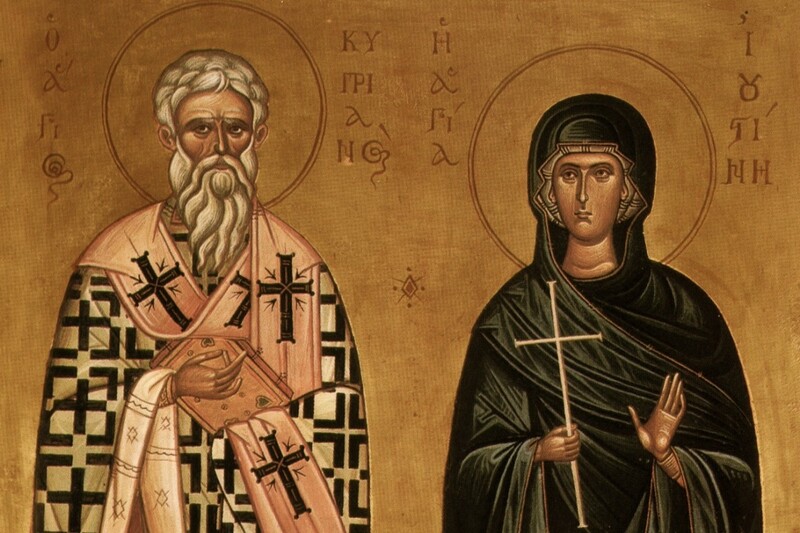 But she was a Christian accustomed to prayer and spiritual warfare, so she began to sign herself with the Holy Cross, called upon the Holy Theotokos, and prayed until she overcame Cyprian’s spell. Not accepting his defeat, Cyprian tried a new spell, which made one of the demons appear as a sweet old woman who came to discuss the Christian faith with Justina. Initially, she was happy to share her faith with someone, but suddenly, the old woman began praising Aglaïdas and Justina knew something was wrong. Again, she signed herself with the Holy Cross and the sweet old woman turned into a foul demon and vanished. Infuriated, Cyprian began trying new spells. With each one, the demons realized Justina was a great warrior for Christ and her weapon, the Holy Cross on which He died for us in love, was invincible. Cyprian became a laughing stock to all the people in Antioch who once feared him, because a young girl with faith in Christ and the Holy Cross proved to be more powerful than he was with all his magic and sorcery. Realizing there was a power higher than the devil and his demons, he abandoned his sorcery and magic in favor of coming to Christ and His Church. He who had been captive to the will of the demons suddenly felt true freedom in Christ. The devil did not leave him alone, but rather, physically attacked him with hundreds of demons, but Cyprian, having learned from Justina, turned to Christ in prayer and defeated them all. He burned his books of magic, was baptized, and then ordained as a deacon, presbyter, and finally, a bishop. Justina ultimately became good friends with Cyprian until he, as a bishop, appointed her a deaconness in charge of a convent of virgins. When this true story reached the ears of the pagan Roman authorities, Cyprian and Justina were arrested and subjected to many tortures, like being boiled alive, but the grace of God covered them so that they endured these tortures until they were martyred for His sake and received the eternal crown. I suspect they would be horrified that, on the one hand, we renounce Satan at the moment of our Baptism, but on the other hand, we embrace cuddly forms of him every October 31st. I suspect they would be shocked that we offer daily prayers to God, saying, “For You have given us the authority to trample on serpents, scorpions, and upon all the power of the enemy” while willingly watching the power of the enemy on television or perhaps even dressing up as them. In those times the love for God in most souls will grow cold and a great sadness will fall onto the world. One nation shall face-off against another. Peoples will move away from their own places. Rulers will be confused. The clergy will be thrown into anarchy, and the monks will be inclined more to negligence. The church leaders will consider useless anything concerned with salvation, as much for their own souls as for the souls of their flocks, and they will despise any such concern. All will show eagerness and energy for every matter regarding their dining table and their appetites. They’ll be lazy in their prayers and casual in their criticisms. As for the lives and teachings of the Holy Fathers, they’ll not have any interest to imitate them, nor even to hear them. But rather they will complain and say, “if we had lived in those times, then we’d have behaved like that.” And the Bishops shall give way to the powerful of the world, giving answers on different matters only after taking gifts from everywhere and consulting the rational logic of the academics. The poor man’s rights will not be defended; they’ll afflict widows and harass orphans. Debauchery will permeate these people. Most won’t believe in God; they’ll hate each other and devour one another like beasts. The one will steal from the other; they’ll be drunk and will walk about as blind. It’s time to do our part to save our souls and those around us, as well. Let God arise, and let His enemies be scattered; and let those who hate Him flee from His presence. As smoke vanishes, let them vanish; and as wax melts from the presence of fire, so let the demons perish from the presence of those who love God and who sign themselves with the Sign of the Cross and say in gladness: Hail, most precious and life-giving Cross of the Lord, for Thou drivest away the demons by the power of our Lord Jesus Christ crucified on thee, Who went down to hell and trampled on the power of the devil, and gave us thee, His venerable Cross, for driving away all enemies. O most precious and life-giving Cross of the Lord, help me with our holy Lady, the Virgin Mother of God, and with all the Saints throughout the ages. Amen. This was the guiding principle in the lives of the Holy Cyprian and Justina, and it should be the guiding principle in our lives, as well… especially on October 31. 3 Responses to "Cyprian, Justina, and our Relationship with Evil"
Such a lovely article dearest Father. Thank you for sharing.